The trend in state prison population reductions that began in 2005 included 24 states by 2009. However, Arizona's prison incarceration rate went from 1 in every 749 persons in 1980 to 1 in every 170 by the end of June 2008. Its average annual prison-population growth rate between 2000 and 2008 was 5.1 percent, compared to a national average of 1.5 percent, giving Arizona the third highest incarceration rate of all states and the highest in the West. Turning the Corner highlights the practices of four states – Kansas, Michigan, New Jersey, and New York – that have recently reduced prison populations by 5, 12, 19 and 19 percent, respectively, while seeing falling property and violent crime rates. The report also spotlights three other traditionally conservative states – North Carolina, South Carolina, and Mississippi – that have revisited their sentencing practices, as well as the work of Maryland's Proactive Community Supervision (PCS) program that introduced evidence-based community supervision practices that produced a 42 percent lower rate of re-arrest for new crimes for program participants compared to traditional probation and parole methods. 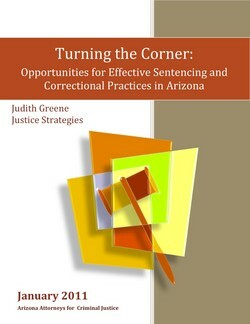 The work of these other states in improving sentencing and corrections practices can help Arizona introduce cost-effective alternatives that can help preserve the public purse and its safety. Arizona Attorneys for Criminal Justice (AACJ) held a press conference this morning to announce the release of a report highlighting the need for sentencing reform. The study, conducted by Judith Greene of Justice Strategies, notes that the state's criminal justice policies have "been among the harshest in the nation for many years" -- and are no longer fiscally viable. Defense attorneys on Tuesday called for a raft of sentencing reforms they said would save money and put Arizona in line with other states that have reduced prison populations and lowered crime rates. But the group likely will have a tough time convincing a majority of lawmakers.